Combine art and snow, and I'm there! 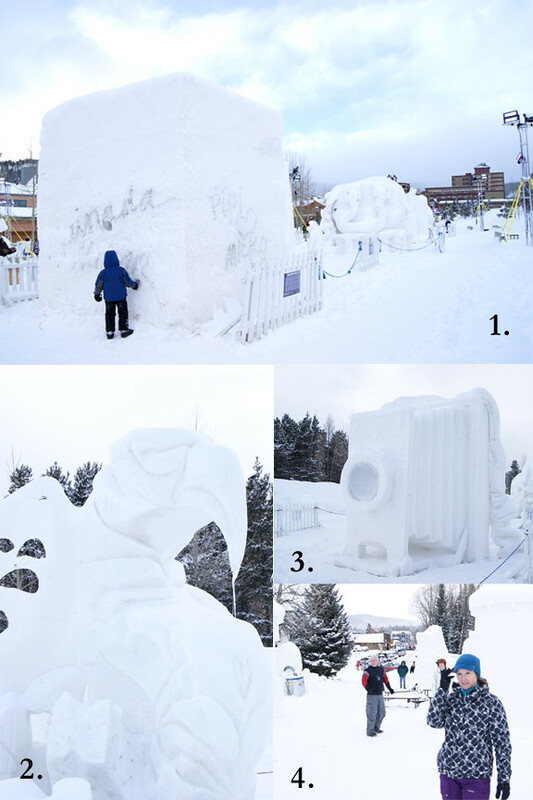 This was the 21st year for the Budweiser International Snow Sculpture Championships in Breckenridge,Colorado. 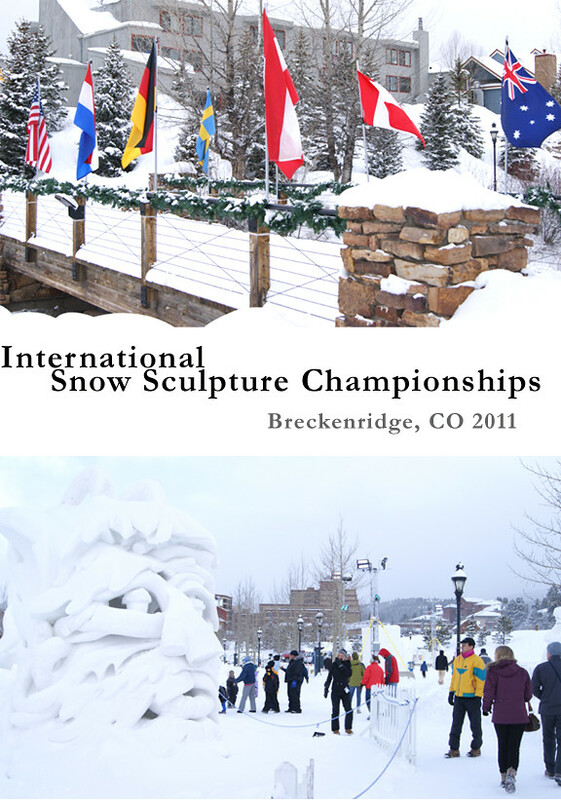 Fifteen different teams from eight different countries, including The USA, Canada, Germany, Mexico, Sweden and The Netherlands, united to transform Breckenridge's Riverwalk Center into an outdoor gallery. The teams were each comprised of four members who were challenged with the task of carving their own 20-ton, 12-foot-tall block of snow (image 1). Power tools, internal supports and colorants were forbidden, so sculptors had to rely on hand tools (imagine sandbox toys and kitchen utensils!) to shape their snow. This year's first place winner was "Alebrije" by Team Mexico (image 2). By the time we got to him, the beak had melted, dripped, and re-froze, but I find that fascinating! Watching the art interact with the environment, and letting Mother Nature have a go at it, is an intriguing part of this event. One of my favorite sculptures was this 1900s style camera (image 3). The lens was a solid piece of ice that was translucent, in contrast to the snow. Though it was blocked by a fence, you felt like you could step under the hood, and snap a few snowscapes! This event is not for the faint-of-heart, the unpredictable weather in the Rocky Mountains can very quickly divert your plans! It was a blizzard all day while we were snowboarding, and then the clouds parted just in time for me to walk through the exhibit and snap some shots (image 4). I love the abstract, so I was immediately drawn to Sweden's entry, "Perpetual Motion," which reminded me of Henry Moore's "Locking Piece" sculpture (image 1). Team Yukon received second place for their haunting sculpture, "Spirits of the Aurora," which portrays the Northern Lights as torches held by spirits seeking the souls of those who just died (image 2). "Mere De Nation" was Team Canada's entry, which paid homage to the adventuresome young brides who crossed the Atlantic in the 1600's to marry the settlers of the Saint Lawrence River Valley. The entire competition lasts three weeks. The first week you can see the blocks of snow being built, the second week allows you to watch the sculptors work, and the third week is for viewing the sculptures before they are taken down. 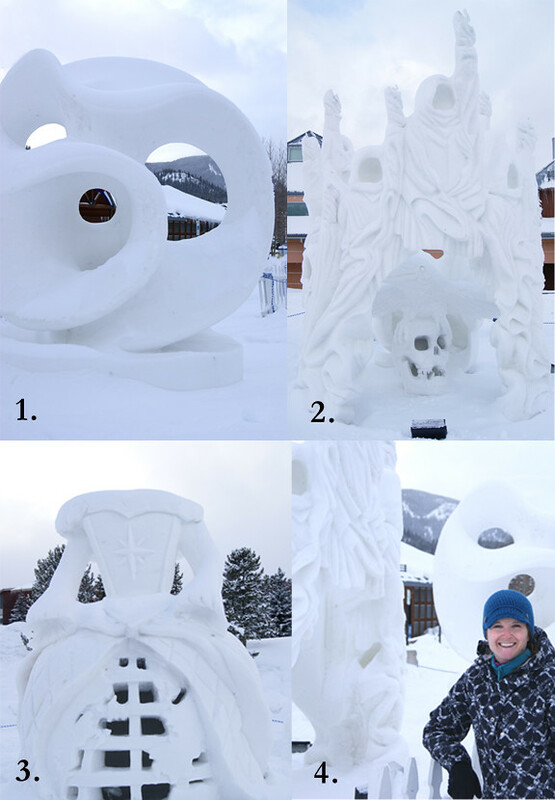 This was my first year to view the snow sculptures, but I look forward to visiting again next year! So cool! I love natural resource sculptures... we used to always go to the NC beaches to see the big sand sculpture competitions. These look pretty amazing! Stan Wagon, captain, Sweden/USA team, 2011.